Maverix SolutionsTM Incorporated has a singular focus – our customers. For them, we will be the leading manufacturer of engineered chemical products that generate outstanding customer value and support them with exceptional personal service. We will approach our customer’s problems enthusiastically with unique and independent solutions. Maverix SolutionsTM started in California making mold release coatings from newly invented unique and innovative chemical technology, which is sold under the brand name, Mavcoat® Mold Release. Our products are shipped worldwide where we have easy access to global markets shipping from our location near the port of Los Angeles. We develop and manufacture anti-stick coatings used in the most demanding applications to release parts made by many types of molding processes including rotational plastics, rubber, polyurethane, carbon fiber, thermoset and thermoplastic composites, injection plastics, fiberglass, crumb rubber, and precast concrete. One of our key visions is to provide anti-stick coatings to any industrial application when needed. In addition, we make unique fast-acting mold cleaners specific to each industry and mold type. Maverix SolutionsTM was established in 1999 and quickly became recognized for our novel technologies that revolutionized mold release performance. Customers immediately reduced scrap rates, improved productivity, and saved money due to easier release, longer production runs, less mold cleaning, and just-in-time deliveries. Maverix SolutionsTM is still the only supplier to manufacture a mold release that acts like a ceramic coating to withstand very high molding temperatures (1,400° F) and longer cure times, which are sometimes required for the latest thermoset systems including bismaleimides (BMIs), polyimides, and phenolics. This increased thermal performance that Mavcoat® provides has yielded approvals from the Navy, Air Force, and other key aerospace and marine agencies. We are unique because our coatings do not build-up, which allows for longer production runs and easier mold cleaning. And our technology is safe for operators and the environment because it was developed to meet California’s world-leading air and water environmental regulations. When chemistry is safe to use in California, it is safe anywhere. We become directly involved in our customer’s processes to provide them with the best initial and ongoing technical support. We conduct regular training of operators to help make them the best part fabricators who can then produce higher quality parts with fewer rejects. Our service is legendary – call and immediately talk to technical specialists or customer service so your questions are answered quickly. We respond immediately to inquires, ship samples same-day as requested, and offer the best product technical support through our field technicians who are chemists. Maverix SolutionsTM has a long term vision to revolutionize current chemistry and become the most recognized and used mold release technology for any process that molds parts from any material. Please contact us with requests for samples or technical assistance. We look forward to earning your respect and becoming your business partner. Maverix Solutions’ mold release coatings and cleaners are used for the direct production of finished products by the customer. 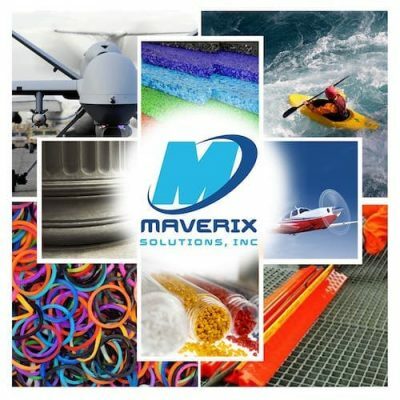 Maverix Solutions’ products and expertise are used as processing aids in the manufacture of engineered materials including but not limited to rubber, polyurethane, plastics, composites, and concrete. Many major national and international customers employ Maverix Solutions’ application knowledge and international procurement procedures to assist in the supply, quality control and documentation of critical manufacturing operations.